In order to make race morning go as smoothly as possible, we have put together some logistics notes below. If you are pre-registered for the race, walk, or dash, you can pick up your bib and shirt the day before the race Saturday, April 6th from 12noon-4pm in front of the Cross River Pharmacy at the Orchard Square Shopping Center at 20 N. Salem Road (Route 121). Runners can also sign up for the race at the early bib pickup. 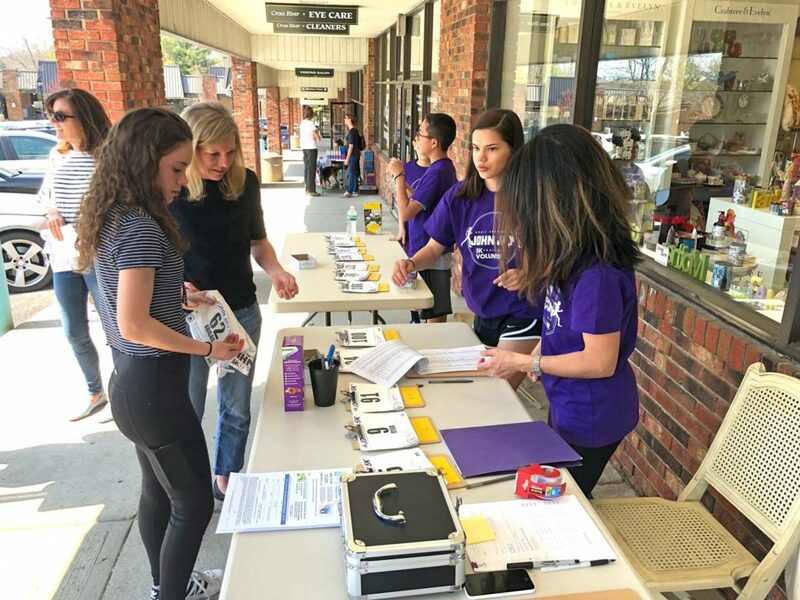 Volunteers handing out shirts and bibs the day before the 2018 JJTrail Race in front of the Cross River Pharmacy. Thank you Stu & Elaine for being a sponsor and letting the team use the sidewalk space! On the day of the race the best place to park is in the upper parking lot at the John Jay Middle School. The entrance is off of Route 121 (North Salem Road). This upper lot is the closest one to the Finish Line of the race and the kids Jay Dash. The map location of the middle school driveway entrance is here: https://goo.gl/maps/Q5xwUQnugFL2. Note: There is more than enough parking at other lots in the school campus in case the upper lot fills up. There are other lots that are closer to the start of the race. See map below. 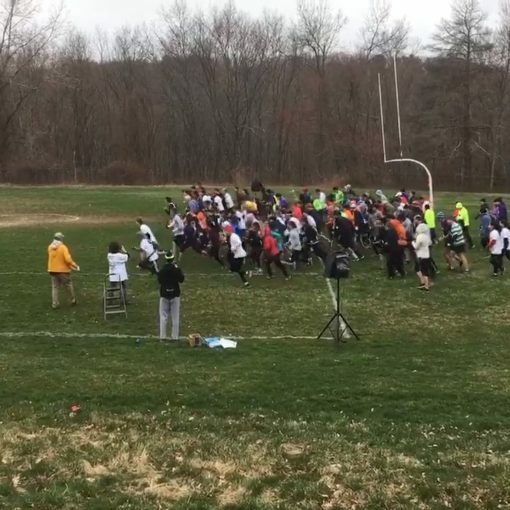 The race finish line is on the John Jay Contest Field (the one with the purple track you can see from the road). 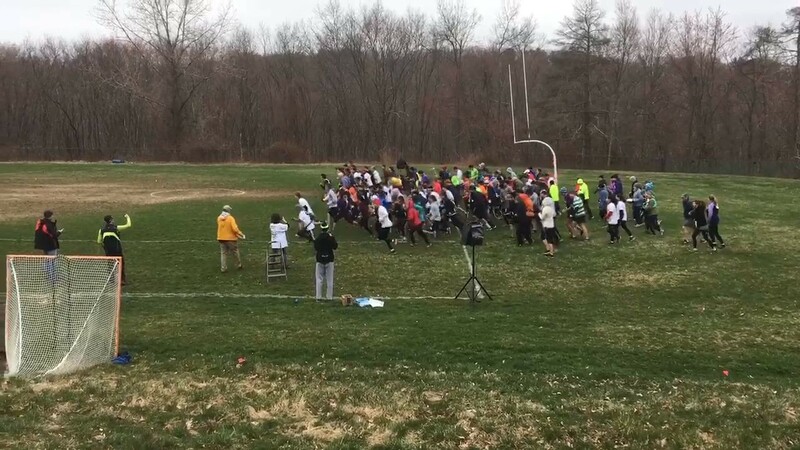 The race start is on the grass field behind the John Jay Middle School. When walking towards the middle school entrance, take the path on the left side that goes around the school and down the hill to the other side of the school. We will have signs posted. Please plan to arrive before 8:30am on race day. 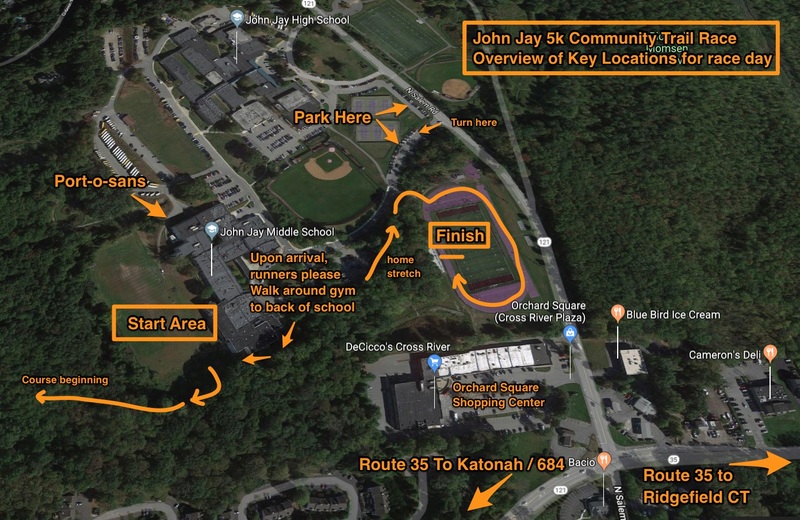 This will allow you to get parked and walk down the hill to the back of the John Jay Middle School where the registration and start area are located. Once you are at the start area you can pick up your bib, get it pinned on, and get yourself familiar with the area. 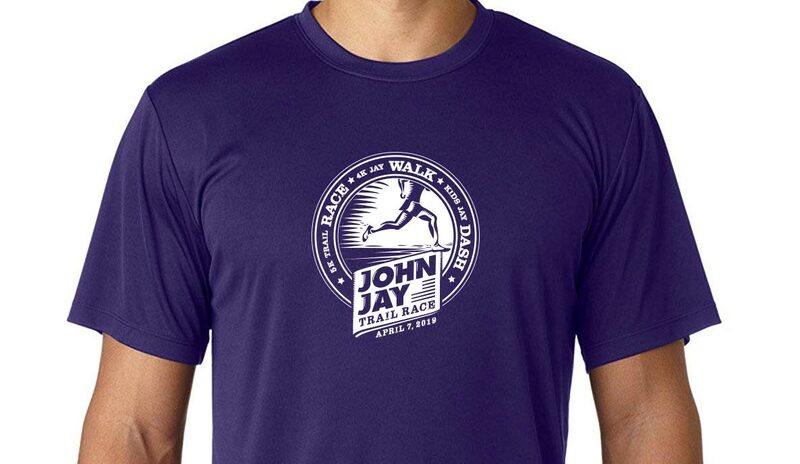 If you are unfamiliar with John Jay Middle School, plan on arriving a bit earlier to get your bearings and get set up to run. Important: There are NO DOGS ALLOWED on school property. Please leave Fido at home for this race. Port-o-sans will be located on the north side of the middle school in the utility lot (see aerial photo below). Get there early to avoid lines. We plan to welcome runners and get things started as close to 9AM as possible on race day. The 4K Jay Walk will start as soon as the 5k runners have looped and are clear of the starting field. The Kids Jay Dash will start after most of the 5k/4k participants have finished — we think that will be around 9:45 – 10am. Note: If your child is running in the Kids Jay Dash but you are not running or walking in the 5k/4k, you can arrive by 9:15am. Parking is in the upper lot or tennis court lot. 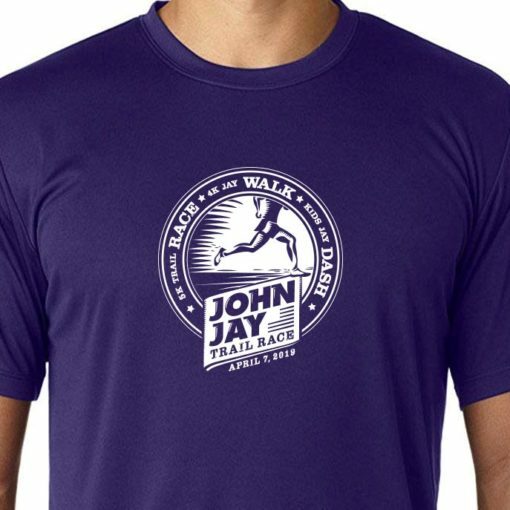 After the 5k/4k start, the organizers will be moving the bib pickup up to the John Jay Contest field and you can get your child set up with their shirt and bib. Post-race awards will start around one hour after the 5k race starts. If the weather is especially chilly or rainy we will make every effort to get the awards started quickly. 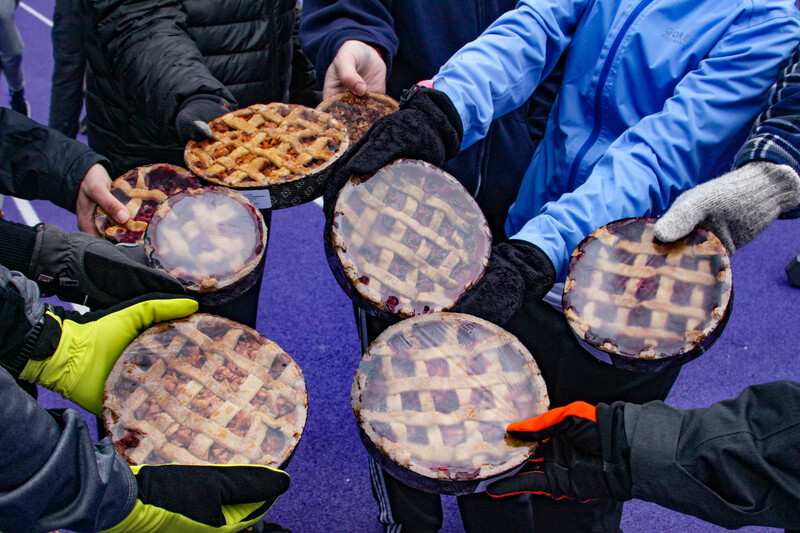 Your help and consideration is appreciated in getting to the start line promptly — especially if the weather is chilly and/or wet! Check the course map and description here. If you are a runner or walker this map will be helpful. If you are a spectator, this will show you where to cheer on your runner or walker! Thank you & see you at the race!